Commemorative US classic stamps and US Commemorative coins were first issued in 1893 to mark the 400th Anniversary of the discovery of America in 1492 and to celebrate the opening of the World's Columbian Exposition (World's Fair) in Chicago. The World's Columbian Exposition, also known as The Chicago World's Fair, was held in Chicago in 1893 to celebrate the 400th anniversary of Christopher Columbus' arrival in the New World. The centerpiece of the Fair was the large water pool, representing the long voyage Columbus took to the New World. The fair had a profound effect on architecture, the arts, Chicago's self-image, and American industrial optimism, such as had been accomplished by the British Exhibition in 1851. The exposition covered more than 600 acres, featuring nearly 200 (temporary) buildings of neoclassical architecture, canals, and lagoons. There were international pavilions representing different countries, and representatives from 46 different countries participated in the fair. Dedication ceremonies for the fair were held on October 21, 1892, but the fairgrounds were not actually opened to the public until May 1, 1893, continuing until October 30, 1893. Over 700,000 visitors attended the fair on its opening day. During the six months the fair was open, it drew more than 27 million visitors. For the year 1892, the 400th Anniversary of Columbus' arrival in the New World, began as a noteworthy numismatic event. In 1892, the US Mint struck their first commemorative coin, a half dollar, marking the anniversary. It is shown above at the bottom. 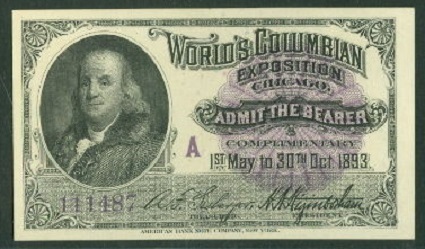 This issue was continued into 1893 for the Columbian Exposition. The US mint also issued a quarter dollar coin for the exhibition in 1893. It is shown above at the top. These new coins mark the issue of our first commemorative coin, the first time a non-American was featured on a US coin, the first time a non-allegorical woman was featured on a US coin, and the first AND ONLY time a monarch (Queen Isabella of Spain) has been featured on a US coin. The half dollar coins were issued in sufficient quantities that they are still relatively common and affordable today. The quarter dollar coins are very scarce. The sixteen US classic stamps shown below (Sc. #230-45) were issued at the beginning of 1893 to commemorate the 400th Anniversary of the Discovery of the New World by Christopher Columbus. These US classic stamps will each be described individually below. These stamps were all engraved by the American Banknote Company on unwatermarked paper, and they are all perforated 12. 01 Cent - "Columbus in Sight of Land" - based on a painting by William Powell (1823-1879), the central vignette depicts Columbus aboard his flagship. At the sides are natives. Varieties of the one cent denomination come with both a double transfer and with a cracked plate. These varieties are worth just a little bit more than the regular stamps. 02 Cent - "The Landing of Columbus" - from the 1842 painting of the same name by John Vanderlyn (1775-1852). The painting is located in the rotunda of the United States Capitol. Varieties of the two cent denomination come with double, triple, and quadruple transfers, broken frame lines, recut frame lines, and cracked plate. All of these are not unreasonably expensive. A popular variety of the two cent denomination is known as the "Broken Hat" variety. Damage to one transfer roll resulted in a chevron-shaped notch in the hat of the third man on Columbus' right on some copies of this stamp. This variety is relatively common and it is little more valuable than the regular stamp. 03 Cent - "Flagship of Columbus" - This stamp depicts the Santa Maria. It is believed to have been from a Spanish engraving, though its source is unknown. 04 Cent - "Fleet of Columbus" - Believed to be from a Spanish engraving, though its source is unknown. Both of these denominations come with a cracked plate. These varieties are only a bit more expensive than the regular stamps. The issued shades of the four cent denomination were ultramarine, pale ultramarine, and deep ultramarine. Errors are known with this denomination printed in blue. These are very rare, with prices in the tens of thousands of dollars. 05 Cent - "Columbus Soliciting Aid of Isabella" - Taken from a painting by the Czech painter Václav Brožík (1851-1901) entitled "Columbus at the Court of Ferdinand and Isabella". 06 Cent - "Columbus Welcomed at Barcelona" - Taken from a door panel in the United States Capitol building by Randolph Rogers (1825-1892), an American Neoclassical sculptor. 08 Cent - "Columbus Restored to Favor" - From a painting by Francisco Jover Casanova (1836-1890). 10 Cent - "Columbus Presenting Natives" - From a painting by Luigi Gregori (1819-1896) in the administration building of the University of Notre Dame. 15 Cent - "Columbus Describing his Discovery" - depicts Columbus returning to the royal court following his first voyage. The original painting by Ricardo Baloca y Cancico (1844-1880) is believed to have been destroyed during the Spanish Civil War. The 15 Cent denomination exists with a cracked plate. It is rare and not priced in the Scott Catalog. 30 Cent - "Columbus at La Rabida" - From the painting "Columbus Before the Franciscans at La Rabida" by Felipe Maso, a 19th Century Spanish painter. 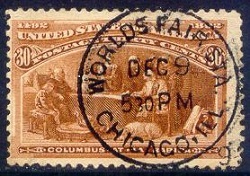 Shown above is an example of the 30 Cent denomination with a World's Fair Station circular date stamp. Of special note for thematic collectors ... I was once told that this US classic stamps issue was the first stamp in the world that includes a DOG in its design. 50 Cent - "Recall of Columbus" - From a painting by Augustus Goodyear Heaton (1844-1930), an American painter, author, and numismatist (coin collector). 01 Dollar - "Isabella Pledging her Jewels" - Based on a painting by Antonio Muñoz Degrain (1840-1924). Both these denominations exist with a double transfer. They are rare and are not priced in the Scott Catalog. 02 Dollar - "Columbus in Chains" - Detail from a painting by Emanuel Leutze (1816-1868), a German American history painter, best known for his painting "Washington Crossing the Delaware". One of only two stamps in the series to depict Columbus on land in the New World, here, he is shown facing charges of administrative misconduct after his arrest in San Domingo. 03 Dollar - "Columbus Describing Third Voyage" - From an engraving by Robert Savage (1868-1943), based on a painting by Francisco Jover Casanova (1836-1890). The three dollar denomination was printed in two different colors, yellow green and olive green. They are worth about the same. 04 Dollar - "Isabella and Columbus" - This was the first depiction of a woman on a US postage stamp. The portrait of Christopher Columbus is from a 1512 painting by Lorenzo Lotto (1480-1557). The four dollar denomination was printed in both crimson lake and rose carmine. The two colors are worth the same in the Scott Catalog. 05 Dollar - "Columbus" - Portrait of Christopher Columbus from the engraving by Alfred Jones (1819-1900), which was used for the Columbian Half Dollar coin. The Columbian issues were the last to be produced by a commercial banknote company. One would think that this new commemorative set of US classic stamps, with their historical vignettes, would have been very popular at the time. This is NOT TRUE! These US classic stamps sold well, but approval was NOT universal. If the US Post Office Department had issued a set of 16 different two cent letter rate US classic stamps, with the different historical vignettes, it would have probably sold out very quickly. Up until 1893, the highest denomination regular postage US classic stamps ever produced were the 90 cent denomination. This set of 16 stamps ranged in denominations from the 1 Cent to the 5 Dollar. A set of 16 individual stamps, in 1893, would have cost the postal customer $16.34, more disposable cash than most people would have had at the time. In modern US dollars, this would be equivalent to about $390.00 for a single set of stamps. As a result, very few of the high denomination stamps from this set were actually sold. An organization called the Society for the Suppression of Speculative Stamps was created in protest over the creation of this set, deeming the Exposition in Chicago insufficiently important to be honored on postage stamps, while some collectors balked at the Post Office Department's willingness to profit from the growing hobby of philately. Ridiculing the $5 stamp, the Chicago Tribune pointed out that it could be used for only one purpose: mailing a 62½-pound package of books at the book rate. In fact, all the denominations above 10 Cents were, for the most part, useless for postal purposes. As a result, covers of the lower values are common, whereas covers with the high values are almost non-existant, with most being "philatelically" created. Today, the 1893 Columbian US classic stamp issues are very expensive. They are not rare, not even scarce for the most part. I recently did an eBay search for the dollar denomination Columbians .... there are 100's of them out there, both mint and used .... and eBay is only one of many auction and retail sites selling these stamps on the internet. However, the Columbian US classic stamp issues are still one of the principal benchmarks for every collection of US Classic stamps, US Commemorative stamps, and even for many thematic stamp collections. from the webmaster's former US collection. 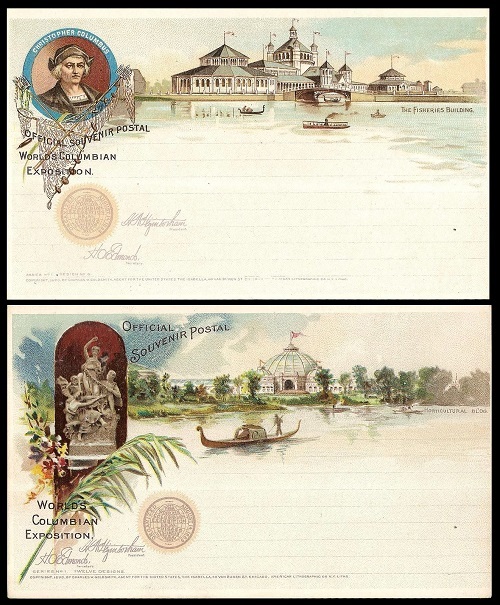 Shown above are two of the 12 different pictorial postal cards issued by the US Post Office Department and sold during the Columbian Exposition. A set of four embossed - stamped envelopes was issued by the US Post Office Department in 1893 for the 400th anniversary of Columbus' discovery and for the World's Columbian Exhibition. The designs depict the profiles of "Christopher Columbus" and of "Liberty". Shown above are cut-squares of the 1 Cent and 2 Cent denomination stamped envelopes. The 5 Cent and 10 Cent denominations are not shown. The color of the stamped envelopes is the same as that used for the same denominations in the Columbian Exhibition stamp set.